Let’s talk eponyms today from epi, “upon” and onyma, “name” — words derived from the names of people. 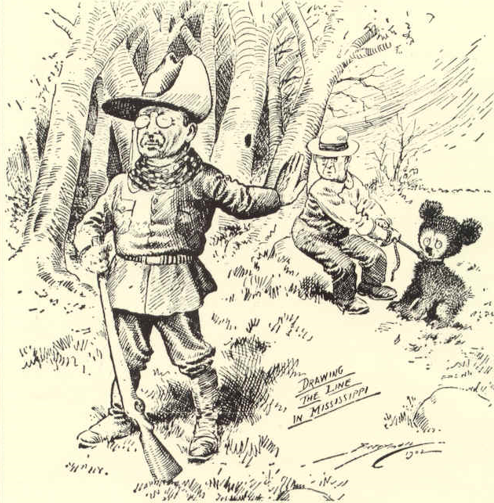 It happened to President Theodore (Teddy) Roosevelt while on a hunting trip to Mississippi. Members of his party stunned a bear, tied it to a tree, and encouraged T.R. to shoot it. The President refused. A cartoonist for the Washington Post depicted the event, and the story caught the fancy of the nation. The rest is history. A Brooklyn candy store owner, Morris Michtom, fashioned a teddy bear out of brown plush in 1902, the first of over 60 million cuddly creatures to bear his name. Less clear cut is case of a delicious log-shaped bar made of chocolate-covered caramel and peanuts. The founder of the Curtis Candy Company named it Babe Ruth in 1921 after President Cleveland’s daughter Ruth. But Cleveland hadn’t been president for nearly a quarter of a century, and his daughter had been dead for seventeen years. It was a blatant attempt by Curtis to avoid having to pay royalties to the Yankee slugger who was at the height of his popularity — a claim they still deny. The evidence, however, shows it, like the candy bar, to be quite nutty.